If you love eating pizza you are certainly not alone. The average American eats 46 slices of pizza each year, which weighs in at 23 pounds. That number might even sound a bit low for some people, but even so collectively that supports a $30 billion a year industry. Most people would agree that pizza is delicious and convenient, but it’s also incredibly addictive. Most pizzas are made with a crust of white flour, which is a simple carbohydrate, as well as quite a bit of sugar in the sauce, which is also a simple carbohydrate. Simple carbohydrates are incredibly tasty because they’re an immediate reward to the body. Those are digested quickly, meaning that burst of sugar hits the bloodstream right away and gives us a little jolt of happiness. But it’s also those jolts that dip back below base level when the blood sugar goes back down, leaving you wanting more. And more. If it sounds similar to a drug addiction, that’s because sugars and fats can cause changes to the dopamine system just like drugs can. Adding to that, we’ve also got the overwhelming deliciousness of melted cheese on a pizza, which tastes so good thanks to it’s extremely salty fat content. Cheese contains casein (like all dairy products), and when we digest casein it releases something that stimulates the opioid receptors in the body, and those receptors have to do with pain control, reward, and again, addiction. But that’s not all. Some research has also suggested that something about the mixture of the textures involved is such a party in our mouth that we’re more likely to keep craving it as well. Think about it. The crunch, the melted stuff, the variety of flavors from whatever toppings you put on. Sugar, salt, fat, and simple carbs all cooked up together taste really delicious. 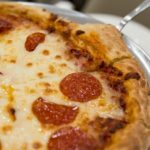 But the good news is that pizza actually has a lot of potential for being healthy, especially compared to some of the other foods on the list of addictive processed foods. The key is to cut down on the overly processed elements and bring in as much fresh, whole foods as possible. Instead of a traditional white flour crust, go with something whole grain to bring in some complex carbs and fiber which will slow down the digestion process and make your blood sugar happier. Or even better swap out the bread crust for a cauliflower one that is extremely low in calories but full of nutrients. Make your own tomato sauce so you can control the amount of sugar that goes into that, and try topping with a lighter cheese like goat cheese. As far as meats go you’re best off with chicken or turkey bacon crumbles, and of course, don’t forget the veggies.